The teams that finished on the top and bottom of the AFC East the previous year met in a NFL opening-week game at Foxboro, Massachusetts on September 12, 1976. The Baltimore Colts were coming off of a 10-4 record in their first year under Head Coach Ted Marchibroda, who had received Coach of the Year recognition for turning around a club that had gone 11-31 in the preceding three seasons. QB Bert Jones (pictured at right) emerged as an outstanding performer and productive all-purpose HB Lydell Mitchell was selected to the Pro Bowl. The defensive line, anchored by DE John Dutton and DT Joe Ehrmann, was solid, as was the corps of linebackers. The Patriots, on the other hand, had not compiled a winning record since they were a pre-merger AFL club and went 3-11 in ’75. 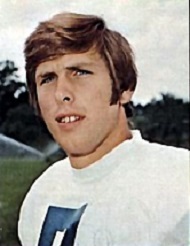 Head Coach Chuck Fairbanks was back for his fourth season and was committed to a new starting quarterback in Steve Grogan, the second-year successor to QB Jim Plunkett, who was traded to the 49ers after five up-and-down seasons. The draft yielded promising players in CB Mike Haynes, C Pete Brock, safety Tim Fox, and HB Ike Forte. There were good returning players in FB Sam Cunningham, HB Andy Johnson, TE Russ Francis, tackle Leon Gray, and guards John Hannah and Sam Adams on offense, and DE Julius Adams, NT Ray Hamilton, and LB Steve Nelson on defense. There were 43,512 fans in attendance on a sunny and mild day at Schaefer Stadium. The Colts got the first break of the game on the third play from scrimmage when Ike Forte of the Patriots fumbled deep in his own territory and CB Nelson Munsey recovered at the New England 14. The visitors couldn’t reach the end zone but came away with a 28-yard field goal by Toni Linhart. A clipping penalty on the ensuing kickoff had the Patriots starting from their own seven, but this time they put together a sustained drive of 77 yards. Forte, Sam Cunningham, and Andy Johnson all ran effectively and Steve Grogan completed three passes. The result was a 31-yard John Smith field goal to tie the score at 3-3. Two short possessions that resulted in punts closed out the opening period, but Baltimore HB Howard Stevens had a 27-yard return to give the Colts good starting field position at the New England 40 to start the second quarter. They reached the seven before coming up empty when FB Roosevelt Leaks fumbled and SS Prentice McCray recovered for the Patriots. New England proceeded to put together another long drive, advancing 86 yards. 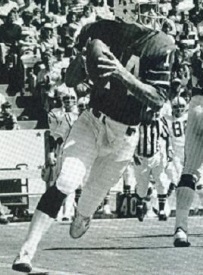 A roughing-the-passer penalty on third down helped the series along and Grogan completed four passes, the longest to WR Marlin Briscoe for 21 yards. Johnson also had an 18-yard run to get the ball to the Baltimore 16, and while the possession finally stalled at the 10, the Patriots moved in front on a 27-yard field goal by Smith. The Colts regained possession with a little over three minutes remaining in the first half and they put together a 78-yard drive in nine plays. Bert Jones immediately connected with WR Glenn Doughty (pictured at left) for 25 yards and a swing pass to FB Don McCauley picked up 12. McCauley had a seven-yard run and, after the fullback dropped a pass, Jones was successful on his next three, the last of which was to Doughty in the end zone for a 12-yard touchdown. Linhart added the extra point and Baltimore was up by 10-6. There were 46 seconds remaining on the clock as the Patriots took over on offense and Grogan went to the air. A short completion of three yards to Russ Francis was followed by a 21-yard gain to WR Ricky Feacher, but when Grogan tried to pass to Feacher again, it was intercepted by FS Jackie Wallace. Wallace returned the pickoff 32 yards to the New England 20, and three plays later Jones again completed a scoring pass to Doughty in the end zone, this time from six yards out. Linhart converted and, thanks to the two touchdowns in a span of 41 seconds, the Colts took a 17-6 lead into halftime even though they significantly trailed the Patriots in time of possession. Baltimore had the ball first in the third quarter and was forced to punt. A long return by Mike Haynes gave the Patriots excellent starting field position at the Colts’ 25. They were unable to capitalize, however, when Grogan’s third down pass into the end zone fell incomplete and a field goal attempt by Smith from 39 yards was blocked by DT Mike Barnes. The Colts put together a long series in which they converted two third downs and nearly scored another TD when a Jones throw to McCauley in the end zone was nullified by a penalty. However, they did come away with a 32-yard Linhart field goal and, rather than the home team narrowing the margin, the Colts extended their lead to 20-6. The next possession for the Patriots ended with an interception but Baltimore, after advancing to the New England 32 early in the fourth quarter, failed to convert a fourth-and-two situation. The Patriots responded with a 68-yard drive in eight plays. Grogan completed passes to TE Al Chandler for 29 yards and Briscoe for 16 and had an 11-yard scramble that set up Johnson’s four-yard carry for a TD. Smith added the point after and the home team was now down by seven points at 20-13. The teams exchanged punts before the Colts got the ball back at the New England 39 following a 34-yard punt by the Patriots from deep in their own territory. Lydell Mitchell ran for 14 yards on first down and, following a penalty, picked up another ten yards on two more carries. Mitchell caught a pass from Jones for 11 more yards and then ran straight through the middle of the line for a clinching 10-yard touchdown with less than two minutes remaining to play. Linhart provided the final point as Baltimore came away with a 27-13 win. The Patriots had the edge in total yards (317 to 272) while Baltimore compiled more first downs (20 to 17). However, New England turned the ball over five times, to one suffered by the Colts. 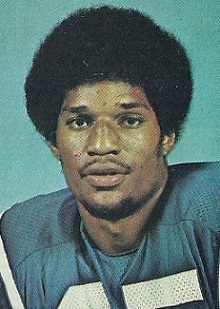 Bert Jones completed 17 of 23 passes for 190 yards and two touchdowns while giving up no interceptions. Lydell Mitchell rushed for 73 yards on 18 carries that included a TD and also had 6 catches for 72 yards. Glenn Doughty contributed 50 yards on his four receptions that included the two key touchdowns. For the Patriots, Steve Grogan (pictured at right) was successful on 12 of 22 throws for 179 yards but tossed four interceptions. FB Sam Cunningham picked up 56 yards on 14 rushing attempts and also topped the club with four catches, for 19 yards. Andy Johnson had 53 yards on his lone catch and also gained 51 yards on 14 carries that included a TD. The Colts won eight of their first nine games on the way to repeating as AFC East champs with an 11-3 record, losing to Pittsburgh in the first playoff round. New England recovered to win its next three contests on the way to also going 11-3, good for a second-place finish in the division (while they split their season series with Baltimore, the Colts had a better record against division opponents to claim the higher spot in the standings). The upstart team qualified for the postseason as a Wild Card and lost narrowly to the Raiders in their Divisional game. Bert Jones received consensus league MVP recognition as he topped the circuit in passing yards (3104) and ranked second in touchdown passes (24), yards per attempt (9.0), and overall rating (102.5). He was selected to the Pro Bowl, as was Lydell Mitchell, who rushed for 1200 yards and caught 60 passes for 555 more yards, which made him second in all-purpose yards with 1755. Glenn Doughty had a fine year as a possession receiver with 40 catches for 628 yards (15.7 avg.) and five TDs.